AP/Mark LennihanRep. 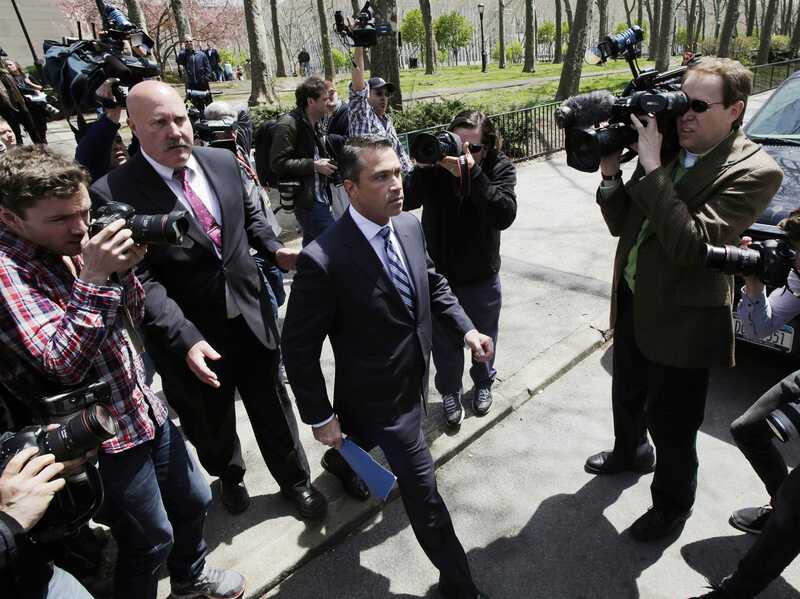 Michael Grimm (R-N.Y.) leaves a news conference after he was arrested earlier in the day and pleaded not guilty. By most conventional measures, Rep. Michael Grimm (R-N.Y.) should have no chance winning his bid for re-election when the votes come in Tuesday night. The two-term lawmaker is currently facing a 20-count federal indictment. His swing district was previously held by a Democrat and was won by President Barack Obama in 2012. Grimm also has more debt in his campaign war chest than cash on hand. To add to these troubles, Grimm has been dogged by a series of strange incidents. He drew national headlines after he threatened to throw a reporter off a Capitol balcony. There are corruption allegations involving an Israeli rabbi. And he was accused of having a 17-minute romp in a Brooklyn bar bathroom last year. Yet Siena College released a poll last Friday showing Grimm crushing his opponent, former Councilman Domenic Recchia (D), by a whopping 19 points. Democratic operatives told Business Insider they are amazed the race isn’t in the bag for their party. “How a voter could stand by a guy facing 300 years in prison is beyond me,” said one. On paper, Recchia is a solid candidate. He’s a formidable fund-raiser and outside entities have poured massive amounts of money into the district on his behalf. Recchia also boasts a record of balancing budgets and funding significant programs as the former finance committee chairman in the New York City Council. In contrast, Grimm’s 2012 opponent, Mark Murphy, was a D-level movie actor whose father once held Grimm’s seat — before the elder Murphy was indicted himself in the Abscam bribery scandal. Still, even with his relative inexperience, Murphy came within roughly 5 points of defeating a non-indicted Grimm. Based on Siena’s polling, Recchia, who has the benefit of running amid Grimm’s recent legal troubles, isn’t expected to match even Murphy’s performance. Recchia’s stumbles have been so bad he was lampooned on “The Daily Show” — twice. In particular, host Jon Stewart tore into Recchia for touting his “great knowledge of foreign affairs” at a campaign event by citing his work on a local school board. “I was on the local school board, I ran a student exchange program with Japan for the students of his district,” Recchia said after dodging questions about a free-trade agreement the day before. Even worse for Recchia was the savage beating he took in the press. Both the Staten Island Advance and the Daily News — two of the most highly-circulated newspapers in the district — endorsed Grimm despite his indictment. The News was especially critical of Recchia and filled its editorial with personal insults. AP/Richard Drew, PoolRep. 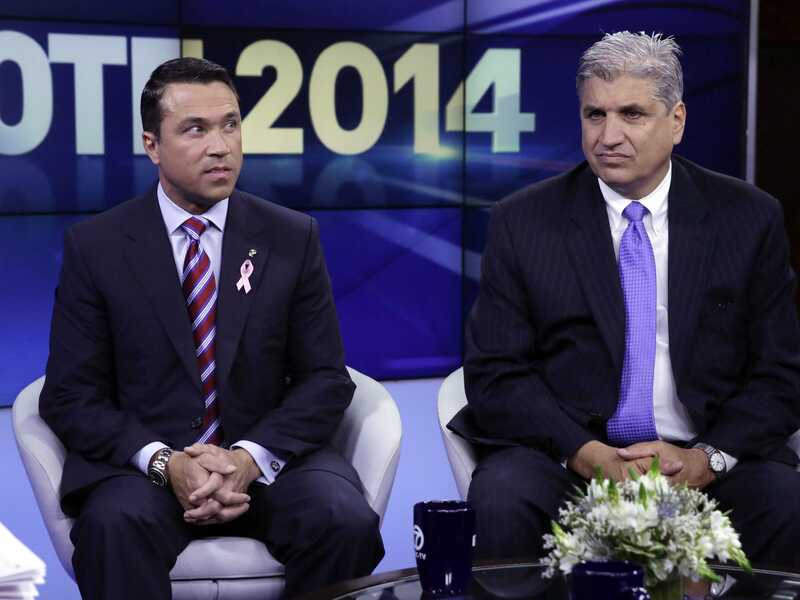 Michael Grimm debating former New York City Councilman Domenic Recchia (D). One of the Democratic operatives suggested Recchia wasn’t adequately prepared for the media onslaught that comes with a high-profile congressional campaign. Indeed, when Business Insider bumped into Recchia at an unrelated campaign event last week, the Democrat simply turned and walked away when we asked about the Advance’s grudging endorsement of his opponent. After we noted the curious exchange on Twitter, Recchia returned to say he simply disagreed with the newspaper’s point of view on his race. Democrats also credited Grimm with doing several things well, notably painting Recchia as a typical tax-and-spend liberal. Recchia’s Brooklyn residence also doesn’t help him in the district, which mostly includes Staten Island. And Staten Islanders, who have long been relative outsiders compared to New York’s other four boroughs, seem at least somewhat inclined to believe Grimm when he proclaims his innocence on the fraud charges, which relate to his management of a restaurant before his political career. “Staten Island voters wake up angry, bitter, embattled and feeling under siege. Grimm plays perfectly into that,” one operative said, predicting Recchia’s ground game would yield an ultimately close race on election night. For his part, Recchia’s campaign called Siena College, the pollster that put him far behind in the race, “notoriously inaccurate” after its survey was released. When asked about his gaffes, Recchia admitted he’s not a great public speaker. However, he touted his work ethic. Reached for comment, Recchia’s campaign pointed to their get-out-the-vote operation.